2B E-stim Electrosex Kit SEXLEKSAKER | SEXSHOP: Stora DILDOS, Gratis Frakt! The 2B currently has 17 controllable and adjustable program modes. We have retained all of the popular functions our old Series 2, and added some new ones so you can now Throb andThrust your way to e-stim ecstasy and pleasure. Split modes, tickle, and programmed wave functions all pack the 2B with hours of e-stim pleasure. The 2B has an optional digital link Interface, which allows you to upgrade and control your 2B from a Windows PC or Mac, and even control your 2B via Internet - all though a simple USB connection and our free Commander software. The 2B is upgradeable - No more out of date toys - Now your 2B can grow with your E-Stim experiences. With new modes and new functions on nearly every update, the 2B is only the beginning of your E-Stim experiences. The 2B uses a single 9 V battery to generate fantastic levels of stimulation. If you wish you can even use certain rechargeable batteries. The 2B has been designed with a with a highly efficient and controllable output system that offers dual power settings so you can run in low or high power, and each power setting is controllable from 0 to 100%. Low power gives an excellent introduction to E-Stim whilst the high power setting offers really serious levels of output designed to satisfy the most ardent electrosex player, without causing too much pain!! and if the standard high power mode is not enough then you can connect an optional universal power supply giving you around a 30% increase in power output as well as longer play times. The 2B is fitted with an adjustable sensitivity internal microphone (no external microphone to break off or loose) and offers true stereo processing, via a 3.5mm stereo input. Designed to plug into the headphone socket of an MP3 or CD player, each audio channel is translated to a powerful controlled pulsing output. As an additional control it is possible to adjust the whole response of the audio processing system, providing a unique insight to stereo based E-Stim pleasure. Unlike other audio triggered stim units the 2B is designed to use normal audio sources as well more specialized audio tracks. A number of which are supplied on an Audio CD, and more can be downloaded from our and other websites. With output channel isolation, built in power limiting and soft start controls (they always start at zero whenever you change a mode or switch the unit on), together with a design ethos that stresses safety at every stage the 2B has been designed to be compliant with all of the major UK, US and European safety standards, and carries a CE mark. The 2B is the same size as our Series 1 and ABox. Slip it into a play bag, it's all you need for electro pleasure and torment. 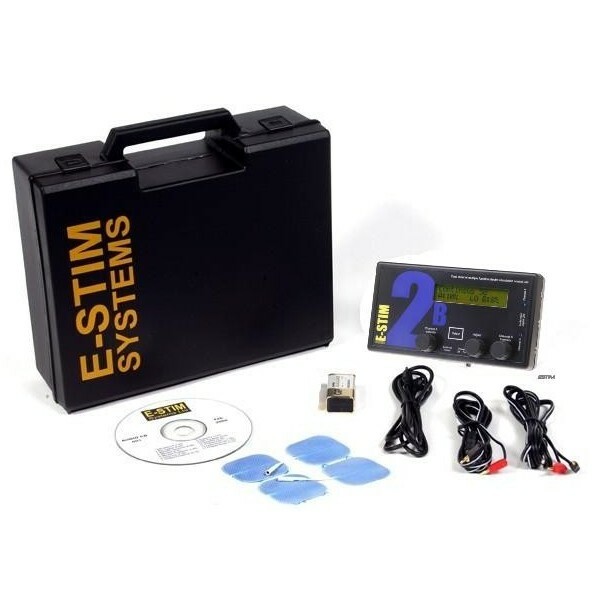 With all of our e-stim technology you are not just buying a box, you are purchasing a serious introduction into the E-Stim world, from a company that is dedicated to producing the best in E-Stim technology. We include a comprehensive instruction manual as well as a protective carry case and the batteries and cable you need to get started. and don't forget the 2B is covered by our lifetime guarantee. Independent controls for Channel intensity, mode selection and adjustment. Denna sexleksak inkom i vårt sortiment den onsdag 15 maj, 2013.